This was a very tough review. It involved eating possibly the best crumb cakes I’ve ever had. I loved the fact that they’re made fresh with natural ingredients, requiring that all the Crumbzz samples be eaten within a few days. Um, yeah I can do that. The cake above is a large one which I used when entertaining a good sized party. The delicious cake was devoured completely, and I found myslelf picking up crumbs of the Crumbzz. So good. 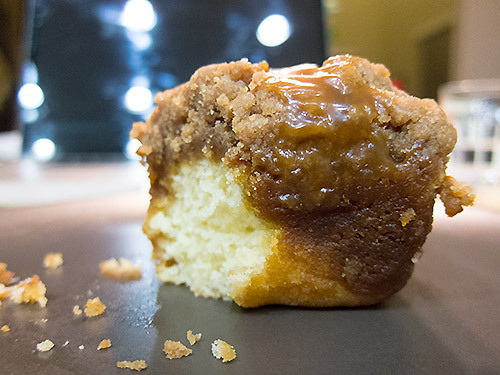 Below is an image of a single serving sized Crumbzz cake. I couldn’t wait to take a bit out of it, so the picture had to wait. 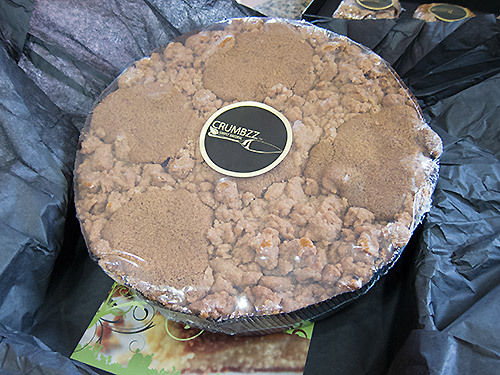 Crumbzz cakes are fabulous, naturally made, and taste as good as any crumb cake ever. They make them to order and ship from Texas. They also have a bistro which I plan to visit the next time I’m near Dallas, Texas. It’s about a 25 minute drive from Dallas.